Then, fade to old familiar small town of Stars Hallow (really the lot of Warner Bros.) framed on a sign that reads “Stars Hollow founded 1779.” Then, the focus is shifted to Lorelai Gilmore (Lauren Graham) placed seated on a Gazebo. Fans of the “Gilmore Girls” will slip into this treat of a peek inside to what the Gilmore women are up to these days very comfortably and will also be pleased to see all the original actors returning to portray their characters. Though a lot has changed, nothing has changed. The world-wind that is the Gilmore women begins with the entrance of Lorelai’s daughter, Rory Gilmore (Alexis Biedel). Pictured (l-r): Lorelai (Lauren Graham), Rory (Alexis Bledel). A key component to the start of this four episode installment is Rory is 32-years-old. The exact same age that Lorelai Gilmore was when viewers first met her with Rory, who was 16-years-old. The two are exactly 16 years apart from each other. As a young teenager, Rory was always the level-headed intellect of the household. So, it was a little unexpected that we now catch-up with a Rory who has fallen to the plight of many millennials bouncing around from place to place, “like a vagabond” as her grandmother Emily Gilmore described. She said, “having no permanent address, that’s not normal.” Without a job, and no footing in her journalism career, Rory returns home to Lorelai who was more grounded at her age. This journey finds Rory jumping from one red-eye flight out of Stars Hollow to New York, and London, to the next. Constantly in a state of travel. On the other side, things have remained much the same for some very familiar faces and friends. Miss Patty (though quite a few pounds lighter) is still running her dance school. Kurt is still jumping from job-to-job while living with his mother. In this episode, Kurt thinks he’s clever to come-up with his own version of popular ride-sharing business Uber, calling it “Ooo-ber”. This only lasts long enough until he is faced with a lawsuit. The local town street singer/guitarist is still standing on corners crooning-up original tunes. Except now he is being threatened by his alleged sister who attempts to do the same. Michel and Jackson are still holding their own at the Lorelai owned Inn, “Dragonfly Inn”, minus Sookie who, as Michel stated with much contempt, is off on a year plus sabbatical in the woods to help cultivate foods to save the world. Thus, the Inn remains in chef limbo where Lorelai displays the same trait as her mother Emily with housekeepers, cutting chefs loose one after the other. Taylor is still running the town with much the same abrasiveness as always. His latest passion project is convincing locals to sign a petition to update the city’s septic tanks to sewers. Then, there’s Luke (Scott Patterson). Luke who is the crabby, yet lovable diner owner of “Luke’s Dinner” and boyfriend to Lorelai. Always supportive of both Lorelai, Rory and his own daughter – a student at M.I.T. by the way, by doing a wonderful thing like updating the diner’s menus to display Rory’s New Yorker article on the back. Then, there are some whom we almost forgotten, like Gypsy, the town’s mechanic. Her patience wears thin while reviving Lorelai’s Jeep Wrangler yet once again. And Lane’s mom. Yes, she still rules things her way with an iron fist. Rory’s best friend Lane, who has two kids, is still rocking out with her band as a drummer with her vocalist husband Zack. Fans will also feel the welcoming familiarity of lovable neighbor Babette Dell, played by Sally Struthers. Emily Gilmore (Kelly Bishop), the strongest and fiercest woman around, is now in a state of uncharted territory, vulnerability after the loss of her husband of 50 years, Richard (played by actor Edward Kirk Herrmann who passed away two years ago). No traditional Gilmore dinner is without a Lorelai and Emily argument. This one erupted after Lorelai pressures Emily to admit that she got Richard’s portrait measurements wrong, thus resulting in a whole wall sized mural. On a lighter note, Emily seems to be getting along with her newest maid Berta whom she can’t understand a word she says, but welcomed her kids (so she thinks) into her vast home. After an argument with Emily, Lorelai is exposed as someone who only thinks about herself and no one else. She then questions Luke if he wants a child with her. Luke hesitates at first, then recaps how he once suggested it years ago at a little league game. This opens a new quest for Lorelai in seeking-out a surrogate operation called “Dynaity Maker” owned by no other than sharp intellect Paris Geller. Yes, THE super over-achiever, Rory’s long-time class-mate/nemesis turned good friend Paris Geller. Paris asserts more ambition and gung-ho to the matter of Lorelai and Luke than Lorelai and Luke that ends with Lorelai turning-down her services. Yet, we know that won’t really be the end nor the last time they hear from Paris on the situation. In the midst of capturing an ever elusive crème de la crème mass media company Conde Nast interview appointment and constructing a biography of a well-known mogul, Rory is also finding little time to balance her love interests of Logan and new-comer Paul whom no one can seem to ever remember, even Rory. 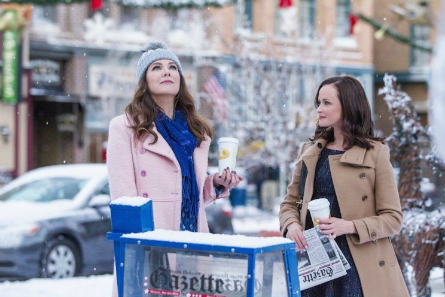 This episode leaves viewers with the possibility that Rory may cave to Logan’s filthy rich father with sick connections to pulling strings for her break with Conde Nast, and maybe a break-through of their own between Emily and Lorelai. The next episode “Spring” opens with a signature Emily and Lorelai moment in the therapist’s office. 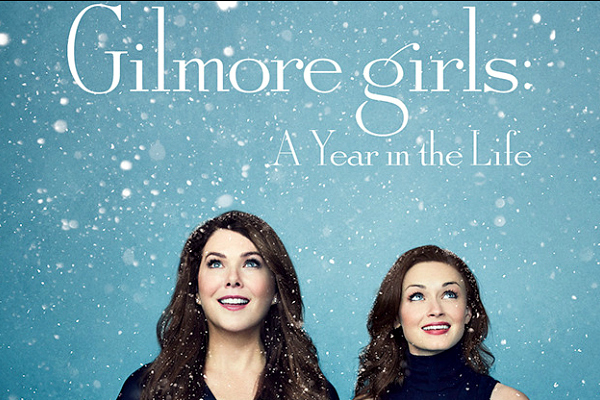 “Gilmore Girls: A Year in the Life” airs online on Netflix.